The Ancient Egyptians held learning and knowledge in high regard and the young Tutankhamun would have received the best education available. The Prince's School was attended by Tutankhamun and other male members of the royal family together with the wealthy sons of the Ancient Egyptian nobility and important court officials. The Vizier, who was Ay during the reign of Tutankhamun, had overall control of the Prince's school and therefore the education of the next Pharaoh, nobles and court officials. The teachers were all men, the most brilliant of the scribes and priests. The school day started education in the morning, a midday break followed by a siesta, and finally afternoon lessons. The Education of King Tut was well-rounded as it included not only academic subjects but also concentrated on standards of morality via the Books of Instruction. 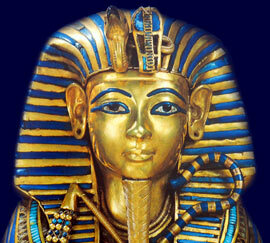 The education of King Tut would have included the use of the Books of Instruction. The Books of Instruction contained rules for living a well ordered life and Egyptian society and culture. The Books of Instruction included elements of morality such as honesty, justice, wisdom, obedience, humanity and restraint. The Books of Instruction allowed for the character building of the young Tutankhamun and taught valuable lessons in government together with the pharaohs' role and responsibilities. The Art of Writing would have been an extremely important part of the education of King Tut. Hieroglyphics were used for writing memorials on great monuments. Hieroglyphics were a system of picture writing which used symbols (hieroglyphs) instead of letters or words. The original hieroglyphs represented sounds and there were over 700 hieroglyphs which could used in numerous combinations to give specific meanings. A simplified version of hieroglyphics was devised known as 'hieratic' writing used to quickly create various papyrus documents losing the pictorial aspect of hieroglyphs. The education of King Tut would have included sports and games to balance the academic lessons. Ancient Egyptian children had a variety of toys and games to play with including board games such as Senet, Dogs and Jackals, the Game of the Snake and Pwer which was similar to checkers. Toys and games reflected people, objects and events which were common in everyday life. King Tut would have played with toys reflecting a man's role. He would have enjoyed boisterous ball games, piggy back and leapfrog. Toy swords and spears were used emulating male adults. The sports which would have been enjoyed by Tutankhamun would have included Archery, Equestrian Sports including Chariot Racing, Fencing, Wrestling, Gymnastics, Rowing, Swimming and Weightlifting.